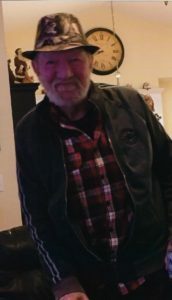 Joseph Doyle Kennedy, age 67, of Auburn passed away Friday, February 1, 2019. Doyle was an avid NASCAR fan. Dale Sr. and Jr. were his favorite race car drivers. He enjoyed dirt track racing and riding horses. Doyle loved his family. He was a subcontractor for over 20 years with Over and Under Contractors. Survivors include his wife Sandy Tatum Kennedy; sons Joseph Darrell Kennedy and wife Sherry of Winder, Tracey Eric Kennedy and wife Diana of Auburn; brother Dennis Law Kennedy and wife Deborah of Mt. Airy; sister Linda Atkins of Elberton; grandchildren Alex Dispain, Krystal Kennedy, Denita Kennedy and Dustin Kennedy; great grandchildren Brantley Kennedy and Karley Reynolds and a host of other relatives. Funeral services will be held 11:00 am Tuesday, February 5, 2019 at Lawson Funeral Home Chapel. Rev. Sammy Everett and Rev. Russell Page will be officiating. Interment to follow at Mount Moriah Baptist Church, 1500 Mount Moriah Road, Auburn, GA 30011. The family will receive friends 6:00 pm to 8:00 pm Monday, February 4, 2019 at the funeral home. Arrangements by Lawson Funeral Home, 4532 Hwy 53, Hoschton, GA 30548, www.lawsonfuneralhome.org., 706-654-0966.